Am 13.November 2015 erscheint eine Live CD von Nils Lofgren. Am 13. November 2015 veröffentlicht E Street Band Gitarrist Nils Lofgren eine neue Live CD. Auf „UK 2015 – Face the Music Tour“ findet man 15 Songs, die Nils Lofgren während seiner diesjährigen Konzertreise durch England Live eingespielt hat. In January 2015, after a three year break from our traditional acoustic UK tours, we headed back in the dead of Winter, excited for another run of shows, town to town, on the bus, sharing music that hopefully spreads some good will and hope to linger with the wonderful audiences we’ve had, decade after decade. Accompanied by Greg Varlotta, our friend and amazing, multi-instrumentalist and our stellar crew, we all set out to do special, inspired shows everywhere. We were all thrilled with the audience response and it was Amy who insisted we record the last half of the tour, optimistic it could lead to an album of live tracks to commemorate this wonderful UK run. She was right and here it is. We hope you all enjoy it. It really is the audience that breaths the life, fire and inspiration into every performance. God bless you all and thanks again for your presence and magical energy, night after night, town after town, note after note. Peace and Believe, – Nils. Die CD kann ab sofort auf Amazon.de oder im Stonepony Shop vorbestellt werden. Eigentlich bin ich kein Freund von Live Alben. 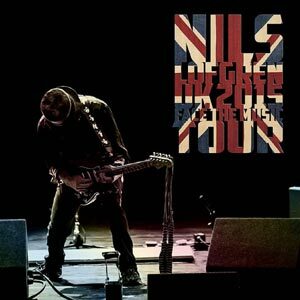 Aber die neue Nils Lofgren Scheibe „UK 2015 – Face the Music Tour“ gefällt mir ausserordentlich gut. Seit Mittwoch läuft das Album in Dauerschleife.